The Hollywood Classic and there Remakes. He's the New Father of His Country! Repairman: All those kids yours mister, or is this a picnic? Frank Gilbreth: They're all mine and believe me, it's no picnic! 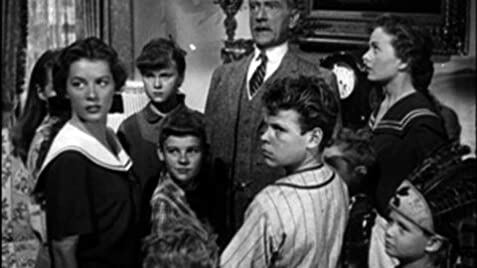 Clifton Webb is a joy in this delightful film, based on a true story, of an eccentric genius and his twelve children. The color is gorgeous, and the interior design of the family's New Jersey home ought to have won an Oscar. 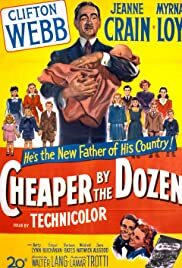 Myrna Loy is solid as Webb's patient, loving wife, and Jeanne Crain energetic as his spunky daughter. There isn't much story here, as events unfold naturally, as they do in life, and one isn't always sure where the film is going. Early twentieth century America is captured in all its overstuffed, art nouveau-ish glory, as the film's plot, irregular, often going off on odd tangents, perfectly mimics that style of design so popular at the time. The movie is really about the end of an era, as we see the very tail end of the Gilded Age turning into the roaring twenties, and with it the death of the old paternalism, at times stiff, occasionally charming, perfectly embodied by Mr. Webb; and there is an awesome sadness at the film's conclusion, as we see a man and his era pass into history.